Settings > General > Popups > and then see if the Warnings or Alerts are the ones to mess with - set them to 0. I believe the lowest pop-up duration can be set is two seconds. I do not recommend doing this. If you are surfing while in passive mode do so at your own risk. You won't be able to know if avast has detected anything. GUI>General>tick Silent Mode is another possibility. Silent Mode should only be used for extremely short duration. See the help file the ? at the upper right corner of the GUI. 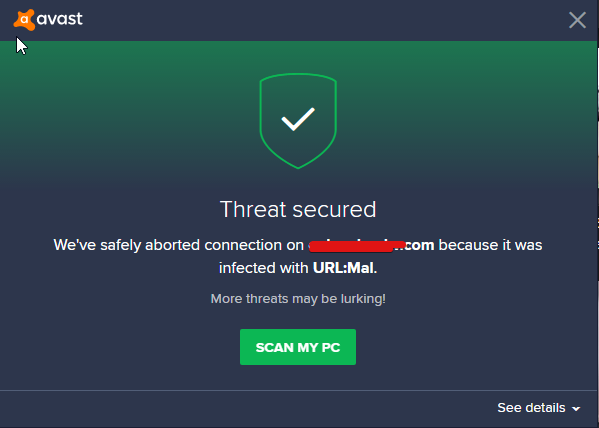 edit: additional The "threat blocked" pop-up is proof that avast is protecting your system. If I remember rightly setting it to 0 seconds has the reverse effect to what you suggest, unlimited duration has to be manually closed. Though there are other options were setting something to zero=unlimited, the virus chest being one. to avoid the popups. It's always best before offering advice to first check out that information before passing it along. I have had them all set to 0 for more than 4 years now and never had a popup appear since, i just get the warning chime from time to time when surfing more dubious sites. Hell, i even forgot the last time i had an update popup, at least 10 years. "All popups in the above list are set to 20 seconds by default. If you do not want to see popup messages from the above list, you can set the duration time to 0 for each popup type or enable Silent Mode in the main settings section." alanb just happens to be right according to the "in gui" help file. I always thought two seconds was the lowest length of duration for pop-ups.